مادربرد Asus z10 PE D16 WS که از سری Workstation می باشد، به عنوان یکی از قدرتمندترین مادربردهای دو سی پی یو دنیا شناخته میشود. این مادربورد دارای دو سوکت 2011-3 می باشد که قادر به پشتیبانی از پردازنده های intel xeon E5 26xx V3 , V4 بوده و با پشتیبانی از 1000 گیگبایات حافظه DDR4 از نوع ECC میتواند تمامی نیازهای محاسباتی شما را در سریعترین حالت ممکن به انجام برساند. از دیگر خصوصیات این مادربورد قدرتمند، وجود 16 اسلات حافظه بروی برد اشاره کرد. مادربرد ایسوس زد 10 پی ای دی 16 ورک استیشن، نامی قدرتمند در بردهای ورک استیشن و محاسباتی است که مجموعه ای از قابلیت های بهترین بردهای تک پردازنده را بروی خود جمع کرده است. از مهمترین خصوصیات این مادربورد در کنار دوال سی پی یو بودن، پشتیبانی از SLI و CrossFire X می باشد. این مادربرد مجهز به 6 اسلات PCI-e Gen3.0 16x می باشد که به صورت بهینه ای برای محاسبات GPGPU طراحی شده اند تا بتوانید حداکثر قدرت و سرعت را در پردازش موازی گرافیکی در اختیار داشته باشید. در خصوص ساپورت کارت های گرافیک باید بدانید که این Motherboard ارزشمند ایسوس قادر است که تمامی کارت های گرافیک از جمله کوادرو، تسلا و فایرپرو و رادون و همچین کارت محساباتی و پردازنده کمکی Intel phi را نیز پشتیبانی خواهد کرد. این برد توابع کاملی از پروتکل های کنترل از راه دور مانند IPMI 2.0 را در اختیار شما قرار خواهد داد تا بتوانید به سادگی مدیریت سیستم را از هر نقطه ای در اختیار بگیرید. این برد مجهز به چیپست intel C612 PCH می باشد. بروی این برد کارت گرافیک Aspeed Ast2400 32mb وجود دارد که میتوانید به منظور کشف خطا و کارهای عمومی از آن استفاده کنید. این برد سه عدد کارت گرافیک را در حالت SLI و چهار کارت گرافیک را در حالت Crossfirex پشتیبانی میکند. همچنین دارای 10 عدد پورت ساتا 6Gb/s و یک عدد پورت M.2 بوده و میتوانید از توابع Raid در فرمت های 0و1و5و10 استفاده نمایید. دو عدد پورت شبکه گیگابیت از نوع intel l210-At با یک کنترل شبکه نیز در اختیار کاربران قرار خواهد داشت. بروی این برد کارت صوتی Realtek ALC1150 هشت کاناله با خروجی های متنوع با توان خروجی 112 dB به صورت استریو و توان رکوردینگ 104dB در پورت ورودی میباشد. بروی برد ایسوس ورک استیشن z10PE-D16 WS 6 عدد پورت USB 3.0 و 6 عدد پورت USB 2.0 وجود دارد. 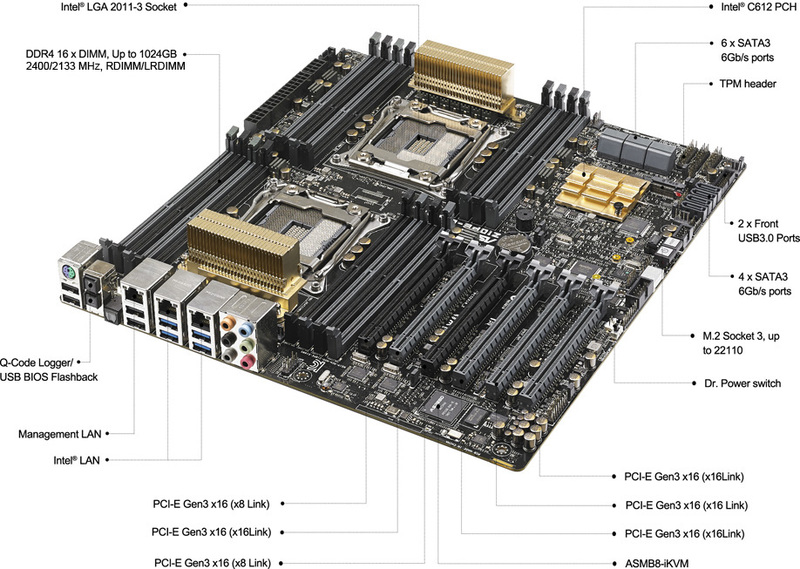 Rich expansion capability with 6 PCI-E Gen3 x16 Six PCI-E Gen3 x16 Slots gives you the sufficient I/O interfaces to fulfill your demand for graphic or computing solution. You’ll be able to run both multi-GPU setups. The board features SLI on demand technology, not only supporting up to three graphics cards in a 3-Way SLI but also supporting up to Quad GPU CrossfireX™ technology. 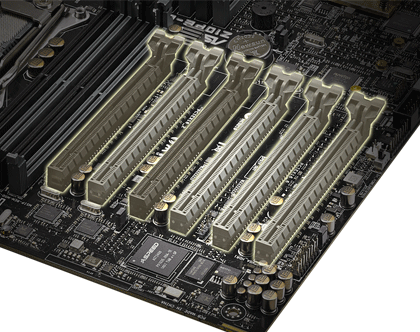 Streamlined-airflow design with 16 DIMM slots in EEB form factor Z10PE-D16 WS packs advanced features onto a standard Enterprise Electronics Bay (EEB) to deliver superior flexibility and performance with dual Intel® Xeon® E5-2600 v3 socket, 16 DDR4 DIMM slots, and six PCI Express 3.0 x16 slots. 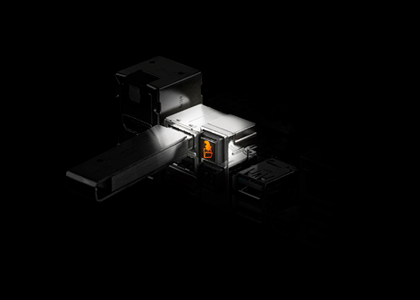 Furthermore, Z10PE-D16 WS’s layout is designed for optimal airflow, with both the processor and memory slots placed in a parallel arrangement directly behind the fan inlet to promote maximum cooling for increased efficiency — making this motherboard ideal for both datacenter and workstation use. Complete remote server management The IPMI 2.0-compliant ASMB8-iKVM module enables remote BIOS updates, standalone KVM/Java utility, video recording and BSOD capture. With out-of-band management ASMB8-iKVM provides round-the-clock remote monitoring and diagnosis even if the server operating system is down or offline, and all through a user-friendly web-based graphical interface that works with all major browsers. 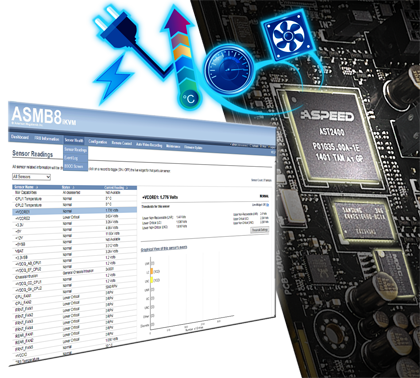 In addition, ASWM Enterprise software provides one-to-multiple centralized management including BIOS flash, software dispatch, task scheduler, remote control and power control, via colorful and informative graphical interface. Q-Code Logger – one-touch checker Q-Code logger is your one-touch checker that lets users easily check system status at any time. 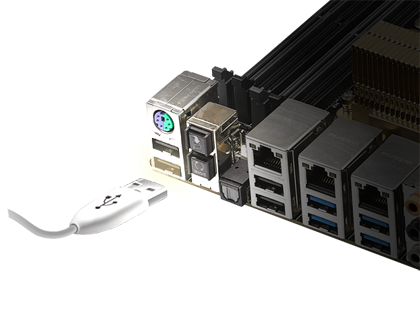 Plug a flash drive into adjacent USB port, press the motherboard's dedicated Q-Code logger button and all ASUS Q-Code event logs for the current live session will be copied to the drive even with the system off. 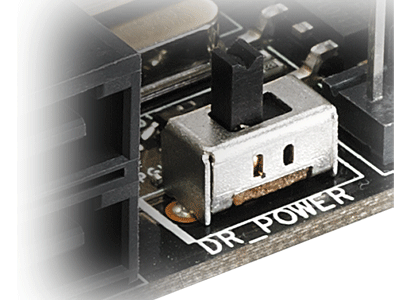 Dr. Power for intelligent PSU detection As the Z10PE-D16 WS is meant for professional users who rely on non-stop operation, stable power delivery is critical. Real time power supply health detection helps prevent sudden system shutdown and provides hassle-free notifications should power delivery be insufficient. Additionally, LED messages on the board clearly indicate any relevant power issues in the event your system fails to boot. 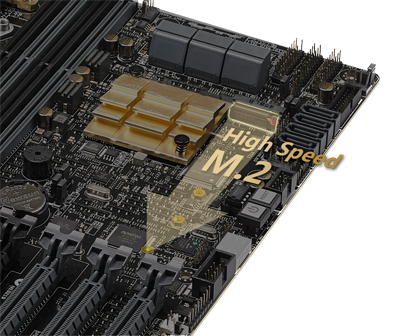 Speed up your system with M.2 With two native PCI Express 2.0 bandwidth, M.2 supports up to 10Gbit/s data-transfer speeds and up to 22110 NGFF. It is the perfect choice for an operating system drive, making your whole PC work that much faster. Faster charging with USB Charger+ USB Charger+ charges USB devices up to three times (3X) faster than traditional USB sockets. Use it to juice up your smart devices even when the PC is asleep, hibernating or powered off — a brilliant convenience! * Charging speed may vary by product. Intel® Xeon® E5-2600 processor family for the LGA 2011 socket The motherboard supports the latest Intel® Xeon® processor E5-2600 v3 product family with dual LGA 2011-3 sockets. Memory and PCI Express controllers are integrated alongside quad-channel 16-DIMM DDR4 memory and 80 PCI Express 3.0 lanes. This provides great graphics performance with superior energy efficiency. Intel® C612 Express Chipset The Intel® C612 Chipset is the latest single-chipset design that supports Intel® Xeon® processor E5-2600 v3 product family for dual LGA 2011-3 sockets. It improves performance by utilizing serial point-to-point links, allowing for increased bandwidth and stability. Additionally, the C612 comes with 10 x SATA 6Gbit/s ports for faster data retrieval, doubling the bandwidth of current bus systems. 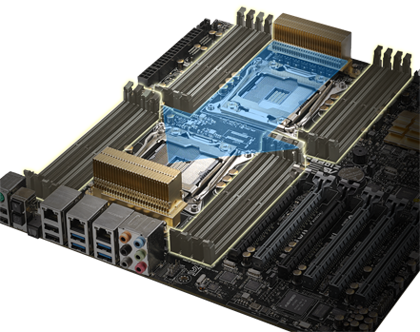 Supports SLI™ and CrossFireX™ Both SLI™ and CrossfireX™ architectures work flawlessly on the new Z10PE-D16 WS motherboard, with PCI Express slots designed to accommodate the power of multi graphics cards. Whether for professional graphics work, heavy duty multimedia or dedicated gaming, more than ample graphics power can be applied whenever needed.